Aren't Lush just on top form with their new ranges at the moment? With Christmas long gone, it seemed like forever until they brought out some more limited edition beauties. It didn't take long before their Valentines range was released and sure enough - it fell around the time of my birthday! BEST BIRTHDAY EVER, WOO! The other week also saw the release of their Mothers Day products, which were just as wonderful as the others! Of course, I had to pick up some of my regular bits and stuff that I've also never tried before - so it seemed wrong not to share with you my thoughts/ first impressions! I purchased Unicorn Horn Bubble Bar last year and I have to say, ever since then it's been one of my favourite baths ever. It turns the water a light pink colour and creates lots of fluffy bubbles! The smell is a mixture between Lavender and Neroli, which brightens your mood - whilst helping you drift away into a relaxing, happy place! I find it leaves your skin feeling and smelling SO great when you leave the bath. I literally don't think I've met a single person yet who doesn't thoroughly enjoy one of these! This is almost too pretty to use, but I need to stock up my stash before Valentine's is over! They seriously need to consider putting this on the shelves all year round. My lips have been having a bit of a crisis lately. I notice they get very chapped and dry, especially throughout our unpredictable winters. I used to have the Bubblegum and Popcorn lip scrubs, which just had to be binned because they were basically ancient and very out of date. Don't worry, I wasn't using them like that! The Kiss is basically my new saviour. It's a beautiful, fluorescent pink colour with loads of little tiny red heart-shaped confetti in. *squeals* This smells & tastes of very sweet sherbert, meaning it's pretty much going to be irresistible. I'm still really impressed with how it leaves my lips looking/feeling and it really tackles those dry, tacky areas! Although the £5.50 price tag may seem steep for it's size, it will last you ages so it's totally justified! 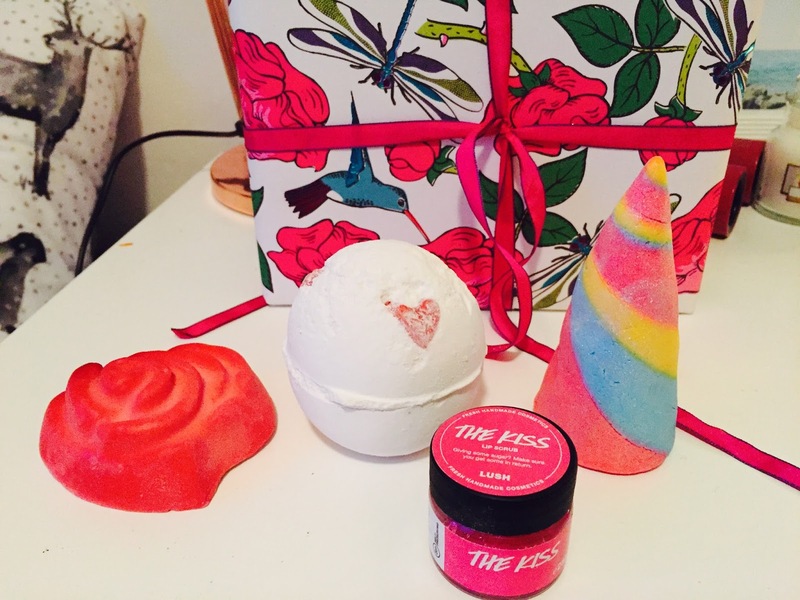 The next thing that made a very quick entrance into my basket, had to be the Lover Lamp Bath Bomb. I think this is the cutest thing ever! It's quite minimal (colour wise) to what I'd usually buy, but it has the little bits of heart shaped confetti to give it that extra special touch. The smell includes tones of vanilla, but not the kind which is too sickly. Aka. Perfection. I'm very excited to use it! The Roses All The Way Soap caught my eye from the back of the store, the moment I stepped into Lush. It is possibly the prettiest soap I've ever seen and even if I didn't like the smell (which I do) I would just buy it to put on display! Soaps aren't always the best thing to wash my hands with, seeing as they dry them out much quicker than a normal hand wash would. However, this includes the likes of Rose Oil and Coconut Oil - so i'll be interested to see if this is different to the others. I thought this was going to have the Rose Jam scent but it doesn't. It's a much more subtle & floral, rose smell without the sweetness of Rose Jam. Seriously, the more I smell it.. the more I love it! Definitely worth your pennies! 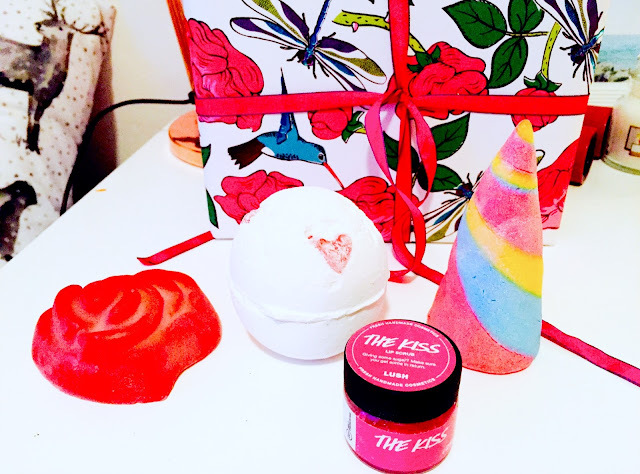 Now, the Rose Bombshell Bath Bomb isn't new to the Lush Mothers Day collection, it's just come back with a completely different look. I'm glad it has a more bold appearance (in comparison to the white one last year) because it's so much better. AND, wait for it.. IT SMELLS LIKE ROSE JAM <3 I actually think I have a Rose Jam problem. Looks wise, this is a wonderful bubblegum pink bath bomb, with flashes of pastel green running through it. Better still; it has lovely, raised rose shaped detailing all over its roundy goodness, and even has some yellow petals hidden inside to float on top of the water whilst you soak! Oh Lush, you're so good. The Ladybird Bubble Bar has to be one of the most eye-catching products I have ever come across! It's cute, although I can't shake the sinister feel I get from it. Tell me you see it too?! It smells of strawberries with hints of peppermint - which to be honest, I wouldn't normally go for. If you're familiar with Lush - I would describe this as a mixture between Peeping Santa (from Christmas) and Intergalactic. I'm intrigued to see how this will smell in the bath! 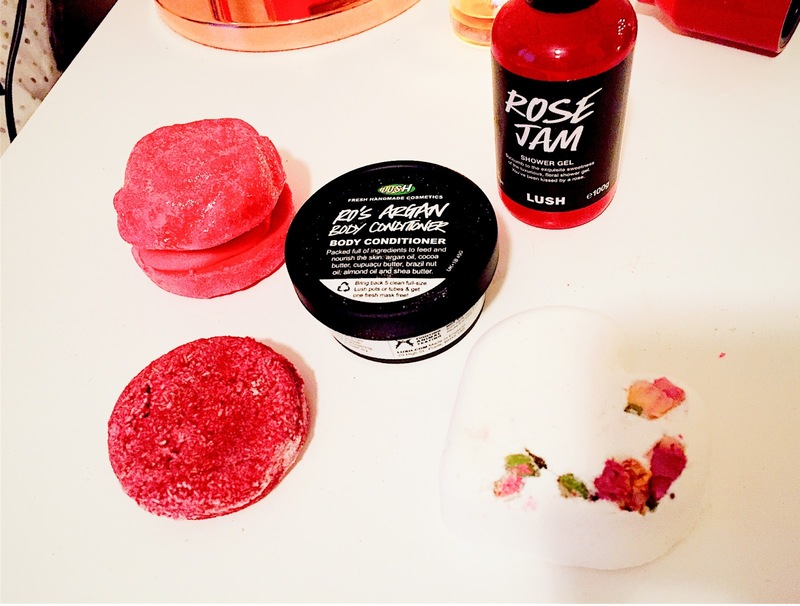 My personal favourites in this set are the Rose Jam Shower Gel, Jason and the Argan Shampoo Bar and Ro's Argan Body Conditioner. They all serve their purpose and do exactly what they say on the tin. This is definitely going to become a permanent fixture in my collection! I have a million and one friends (bloggers or not) who continuously rave about this mask. Like I've said before, I'm not normally a huge fan of mint if it's going on my skin, but it's slowly growing on me. It's incredibly refreshing on your face and tackles all your troubled areas, such as breakouts. It's also self preserving (hallelujah) which is amazing for me, as I always forget to put them back in the fridge (meaning they smell funny or go off) I know with this, I will be able to use it at my own pace and not feel rushed to finish it. Yay! I absolutely loved the Granny Takes A Dip bath bomb, so this Bubble Bar has a lot to live up to. I can't imagine it'll be as colourful as it was in bath bomb form - but either way I wanted to try it! I personally prefer bubble bars over bath bombs, as the inner child in me will always love something that adds a bit of fun! My inital thoughts on this scent reminded me a bit of play dough(?!) Although, I know they always smell a lot different when they're in the tub! 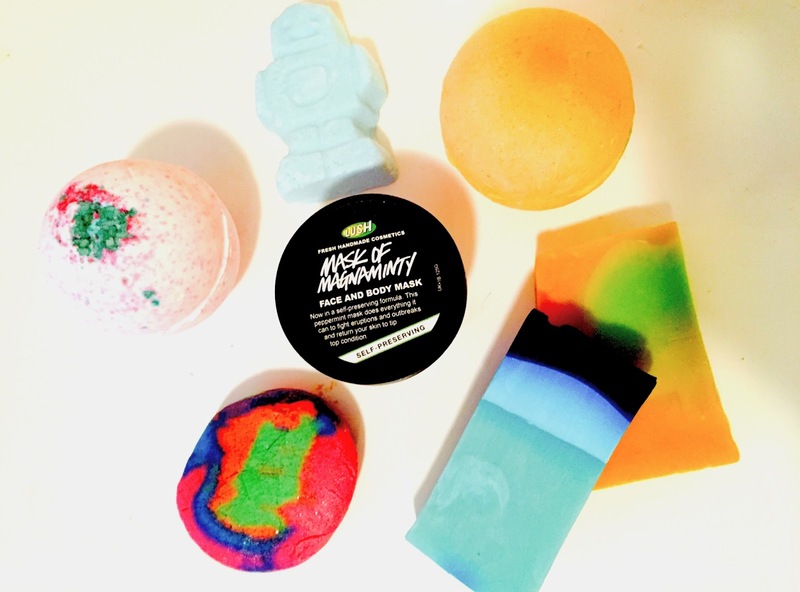 It claims to have that spicy, citrussy scent that will pep you up and boost your mood when needed! If anyone has tried this, please let me know if it's any good?! This is the kind of bath bomb you need if you're needing a bit a relaxation before sleep. It is aimed at kids, but hey.. We're all children in our own way, right?! It's got subtle tones of lavender and is a soothing light blue colour in the water. Perfect if you just want to drift off after (or during) a long soak! This is a very summery scent for a soap; so it was obvious that I couldn't resist it! It smells of Kiwi with hints of citrus, not making it too much of that sour smell. It includes Juniperberry and Bergamot oils - which claim to break down dead skin cells and brighten up your skin. I can't say I've noticed yet (I've only used the soap once!) but I will report back if it's anything to write home about. The freshest smelling soap I have ever purchased! If you were a fan of 'Baked Alaska' at Christmas, this is the closest you will get to it. It smells very lemony with hints of peppermint, making it one heck of a mood lifting scent. If it was in Air Freshener form, I think I'd be bouncing off the walls all day, every day! I digress.. haha. I love anything blue and turquoise as I just associate it with being clean and sunny holidays! I really recommend this! What have you been loving from Lush recently?